Listen to "The Lion's Game: Booktrack Edition" on your iOS and Android device. Detective John Corey, last seen in Plum Island, now faces his toughest assignment yet: the pursuit and capture of the world's most dangerous terrorist -- a young Arab known as 'The Lion' who has baffled a federal task force and shows no sign of stopping in his quest for revenge against the American pilots who bombed Libya and killed his family. 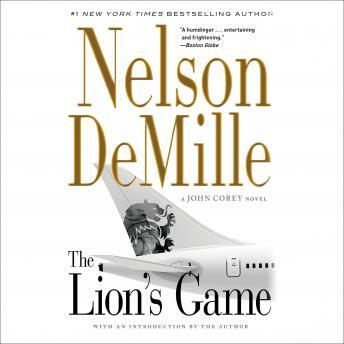 Filled with unrelenting suspense and surprising plot twists at every terrifying turn, THE LION'S GAME is a heartstopping race against time and one of Nelson DeMille's most riveting thrillers. as the first audio book I have ever listened to, I was pleasantly surprised! Very good read. Love John Corey's wit. Can't wait to read next John Corey book. Brilliant and the narrator makes me feel like I'm really listening to Corey. Great actor! This is my favorite author and he did another fantastic job!